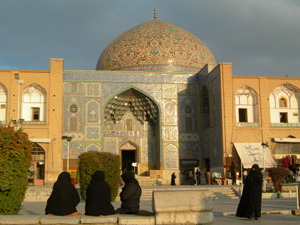 Qom is considered a holy city in the Islam Shiite, since the sepulchre of Fatima is located there; she was the sister of the seventh descendant of the Islamic prophet Muhammad. The city is the world centre of the studies Islamic Shiites, and it is an important destination of pilgrimage. My way to the south was much more difficult than the way to Tehran, the mountains reach 4000 mt high, and during several days it was too cold and snowing. But the mountains and the climate weren’t the only thing that hindered my cycle, but the daily situations. In several occasions while I cycled many motorcycles or cars moved nearer me, the people were so curious, but due to the difficulty to understand each other, some of them bother me. Sometimes after one left another came, because they were waiting for me. Also the police several times ordered me to stop for a passport control; and a couple of times they ordered me to go to the headquarters where I was delayed two hours, and where I had to answer personal questions to satisfy their curiosities. For it, I decided to eat the chicken that I carried with me in the chief’s office, and it was funny, because at once they allowed me to leave. What happens is that people from inlands don’t have contact with tourists, and much less with cyclist travellers, because of this, what should be a pleasure many times it became in a bad moment. 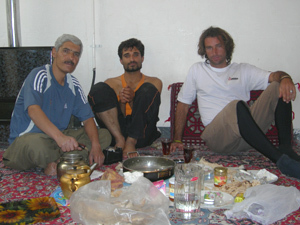 During my journey through Iran, I had to request several times for a place to sleep. 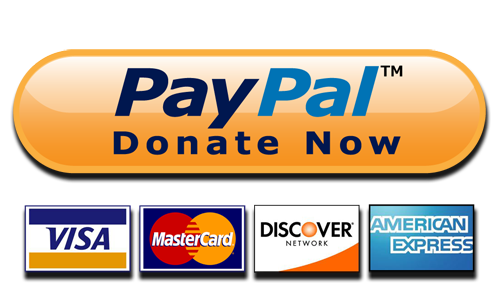 Iranian people always are ready to help. At the beginning they are so curious and by means of signs and with some pictures and maps I am able to explain to them about my journey. And we understand each other, they like to know about me and with some of them, I really enjoy, and we laugh. But in the Iranian winter the night comes so early, so around 6 or 7 pm I don’t have anything else to tell them. The communication with some people is almost impossible. And the dinner is served late because they have a guest; sometimes I would really like to cook and to go sleep early. But they don’t allow it me. People don’t imagine how tired I am after cycling 100 or 120 km, and that I need to rest. So, the night is so long and almost always after a couple of hours friends, relatives and other onlookers start to arrive, because of the news: “At home there is a foreigner”. Then during several minutes, they just stared at me and I have to explain and to show everything once more. 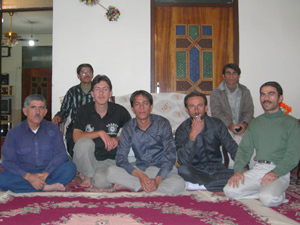 During my journey through Iran I was hosted at several homes, but I really enjoyed them where I met someone who knew at least few English’s words. Although it was never missing the funny guy who for not understanding each other makes fun of me, and makes laugh to everybody. On my way to the south, I visited Qom. Qom is considered a holy city in the Islam Shiite, since the sepulchre of Fatima is located there; she was the sister of the Imam Ali Ibn Muse Rida, the seventh descendant of the Islamic prophet Muhammad, and the eighth of the Twelve Imams. The city is the world centre of the studies Islamic Shiites, and it is an important destination of pilgrimage. For it I got up early in the morning and I went to the mosque, one of the biggest and famous in the country. I tried to enter from several entrances but they didn’t allow me; then I decided to show to one of the watchmen the national newspaper where I was interviewed so he called to his boss and told him about me. It was a good idea because at once they allowed me to enter; although only to visit the huge courtyard and escorted by a watchman. Then my road continued toward the wonderful Isfahan, the third biggest city in the country. It has beautiful bridges, boulevards, palaces and so many mosques. The “Naghsh-i Jahan Square” is World Heritage Site by UNESCO, and it is an excellent work of the Islamic and Iranian architecture. Also it is considered as one of the biggest squares in the world. It is amazing. On the road once more I kept cycling to the south, I took 4 days to cross the mountainous range that reach till 4000 mts high. I remember that in spite of I wore gloves; I had cuts in my hands and lips caused by the drop temperature. It was so cold!!! The following city was Izeh, but due to I arrived early I preferred to keep cycling, although later I regretted it. That afternoon I didn’t arrive at the town where I expected and already in the darkness I had to stop to request lodging in a house where I sighted a lit fire. But in the entrance there was a barrier, so I preferred to call and to make lights with my torch from outside. After several minutes two boys came closer, they were soldiers, since I was in a military area. “Damn!” I thought. They were with weapons. So I had to explain by means of signs that I looked for a place to sleep. But they were clear, “here it is not possible” one told me, so I tried to leave. But a soldiers who had a machine gun became obstinate with me and he didn’t let me to leave, tugging from my bicycle. Then he began to make phone calls, but nobody replied him. So I insisted on leaving and I pushed my bicycle. I felt impotence. The other soldier only watched. During 10 or 15 minutes I tried to be nice, of interpreting all his questions and replying him, but we didn’t understand each other. The armed soldier had my torch, and very exited he pointed the torch at my face and to my bicycle. Once more in this country I was in a situation where the power and the ignorance harassed me. Finally I was able to leave, although it didn’t end there. After 5 km while I cycled in a total darkness I was crossed by a car who orders me to stop. He is the same soldier who gets out of the car and orders to his driver to leave. I thought the worst thing. Suddenly, the soldier with too much determination takes my bicycle and he orders me to return. I don’t understand anything; come back for a control? Or maybe someone authorized me for sleeping there. But I was no longer interested, so we start to push the bicycle again. I was scared. I didn’t want to discuss with the soldier and much less to avoid a control passport. But the situation gets out of control so I have to be firm with him and I shouted. And suddenly the soldier let me to go. I was clever to don´t bring Clara to cycle through this country”, I thought once more. 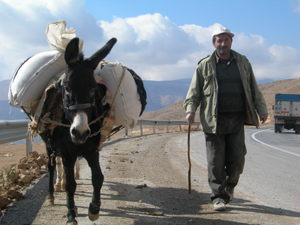 Iran is not an easy country for travelling, and much less by bicycle and with a girl. According to the economic hotels regulation where I stay, the passport should be in the reception for the police control at night. During my journey I heard about a couple of tourists who while they slept in a cheap hotel they were invaded by the police at middle night; the reason explained to me a friend: they weren’t married”. My journey through Iran kept going toward south, up to Ahwaz, and finally after other 1000 km I arrived to Abadan port, where I embarked to Kuwait. I was happy, I needed new air and to rest.